I had a very back pain recently, so bad till I had to force myself to wake up every morning. I realized that it caused headache and lack of focus on my work too. Could it be stress? I should went to see the doctor. However, I didn’t. I Google out ‘5 quick to Help Prevent Back Pain’ and put on a vows on each of the points. The points will help me figure out what should I do in the future. #1 – Get up and get moving – Exercise. The best cure of all is getting wet as sweat. Jogging and cycling is the best cure for me. I need to put in my schedule again and get it done wisely. #2 – See your doctor – My last check up was, I can’t even remember. It is a sign that I didn’t visit the doctor. Will be going by tomorrow. Need to start fasting tonight and ready with doctor’s advice. #3 – Lose weight – Obviously, I am overweight. Will note this down and ask the doctor what I should do with it. #4 – Good posture – Stop lazing by putting on my chin on the table might help me. Keep smiling and be more elegant. #5 – Rest easy and properly – I’m going to look for a new mattress. And sleep at least 8 hours start from now. It’s easy and I should be thankful to the internet and will start to be healthy again. 😉 As a good start, as planned, I went to visit my better half and enjoy the weekend with him. He is adorable as always and we spent the weekend very wisely. He even caught me sleeping while he was driving in his car. Surprisingly, I have no problem sleeping when we are together rather than those days back at home. Over the weekend, at Friday night, I went out with Merl, Bert and Fanny at Fong Ip, Gaya Street. I bought a new laptop, an Acer series. I am very satisfied with my new laptop though a bit awkward as I already familiar with touch screen type of laptop. Back to basic not a big problem as well. Then, I plan to stay at Cahaya Bridal on Friday night, but I didn’t inform them earlier and end up sleeping at KKIA the whole night. Glad Bert has a kind hearted and accompanying me a while before leaving and left me all alone wait for my flight at 7 in the morning. I had to be awake to make sure all my things are safe. There were few of people of sleeps at the airport seats, but I was worried as I have Nikon and Acer in hand that could not made me fall asleep. Checked in at 5.30 am and ready to fly to Lahad Datu, some friends did text me and ask me where did I go eventually? Well, my answer now is Lahad Datu. It was a good therapy for a distance relationship, and the recipe is get engaged first. Then, you may enjoy the happiness of being together and the power of give and take. I reach about 8am and he already at the airport waiting for me. Both of us still have the nervous feeling though it’s been 4 years and more months being together. Thanks to the patient and love that grows within us. We had breakfast together and unpack my bags after that. 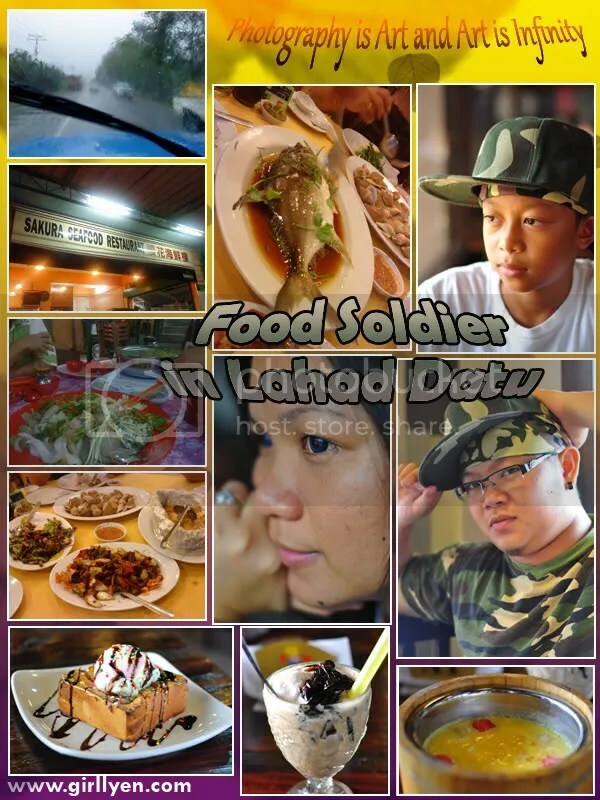 We enjoy eating and sightseeing while holding hands throughout Lahad Datu. It was the best weekend of the month. In fact, we went to the church together for blessings. Happy moment ended too fast. Today, I’m home and facing the four blank walls again. Luckily, KK bless with heavy rains. Indeed, I saw one accident and heard another one accident happen today. Be careful on the road especially in rainy season. ← I’m not feeling well..
sejak bila la kazen2 sa jadi solja nie…tukoi~! cantik oh tu contact lens kau hehehe warna biru :D.